Edward F. Nesta and I had the good fortune to experience this inviting French restaurant during a trip to Sweden in May 2008, where Chefs Danyel Couet and Marco Baudone have a classic French focus with a hint of Italian elements. 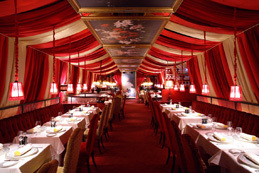 The restaurant has a tented ceiling of alternating crimson and champagne fabric with paintings secured on the ceiling. Sensual red crushed velvet banquettes and red velvet high backed tufted chairs flank the tables immaculately dressed with fleur de lis and leaf pattern ivory linens with matching napkins rolled and set on gilt and floral charger plates. Glitzy clear beads cascade from the railing above the banquettes, and hanging lamps are sexily dressed with red sheer fabric, crystal lamps wear dashing shades with brown feathers, and music plays softly in the background. The restaurant is perfect for couples looking for a romantic evening with its intimate tables for two, although there are also larger round tables for parties. le Rouge has an excellent bar and cocktail menu where mixologists Robert and Richard "Chille" are the talent behind the well-stocked bar. Known to indulge in a cocktail or two, we started our evening in the bar where Richard "Chille" created a special champagne cocktail of the evening for Edward made with Dubonet, Absinthe, Cognac, champagne, Angostura bitters, and Fee Brothers bitters. Every new cocktail needs a name, and after tasting a sip of Edward's drink, I named it The Sweet Truth or Le Doux Vérité since le Rouge is a French restaurant. Robert mixed up a tasty aromatic cocktail named Herbal Verde for me made with Bison Grass Vodka, pineapple juice, pineapple puree for texture, lemon juice, raw sugar, and sage. Finally seated at our intimate table for two for a tête-à-tête, Chef Marco began the evening of tasting by sending us a delicious Greeting of chorizo on toast, tapenade with a tiny slice of gherkin on toast, radishes, olives, and bean puree with cherry tomatoes. Next came a starter of Seafood Escabeche en gelée marinated with lemon and garlic that was a lovely mélange of scallops, shrimp, and squid, with chopped diced vegetables that had a wonderful fresh taste, paired with a 2007 Domdechant Werner Hocheim, Riesling, Erzeugerabfüllung, Rheingau, Germany with 12.5% alcohol. Edward continued with Black footed farm pig en Cassoulet, confit of coco beans, tomato, and rosemary, which was expertly paired with 1922 Bodegas Toro Albala Viejisimo Solera Amontillado from Andalucia, Spain with heady aromas of spice and nutmeg. I had a Niçoise salad with seared tuna cubes, carrots, and an orange mustard dressing, that was paired with a 2007 Lorimer, Grüner Veltliner from Austria, that was dry, with green apples on the palate and almost cider-like notes. The evening progressed with a main course of Beef Tenderloin Moulin Rouge with spring vegetables of lima beans, peas, baby carrots, beets, and button mushrooms, tarragon, and port for Edward, that was paired with a 2004 Château Belair, Premier Grand Cru from Saint Emilion. This dish was presented with the beef on the plate accompanied by a copper pot of creamy mashed potatoes. I continued with the Oven Baked Dover Sole à la Moléne with white asparagus and champagne that was another gorgeous course that was well matched with a 2005 Bouzerone. This course was elegance in white with two rolled filets of sole emerging from foam with thinly sliced radishes, fresh green peas, and garnished with sprouts, accompanied with new fingerling potatoes in a separate dish. A cheese course arrived next with a lovely mix of cheeses from Loire, Lyon, and a mature cheese, accompanied by apple marmalade and thinly sliced delectable fruit and nut bread. The cheese was paired with a 2004 Dolç de Mendoza, from Enrique Mendoza with 15.5% alcohol, that had a deep burgundy color, rich, spicy, and fruit on the nose, with red raspberries, red currents, and raisins on the palate. Glorious rhubarb season had arrived in Stockholm and we indulged in dessert of Rhubarb Gateau Napoleon, which consisted of rhubarb ice cream, cake with strawberries topped with a thin sheet of white chocolate, and garnished with fresh mint leaves. The dessert was paired with a 2007 Saracco, Moscato D'asti from Piemonte, Italy, 6% alcohol with sweet, ripe pears and white peaches on the nose and palate. With its intimate and sensual crimson décor, le Rouge reminded me of a valentine box filled with luscious chocolates and tied with a luxurious satin ribbon. Bring your special someone for a romantic evening, scarlet lipstick and nail polish optional. le Rouge is housed over three floors and features two cocktail bars. The restaurant is open for dinner Monday - Saturday from 5:00 pm until 1:00 am and le Rouge Bar is open for lunch Monday - Friday from 11:30 am - 2:00 pm, and in the evening Monday -Saturday from 5:00 pm - 1:00 am. Read other articles on le Rouge in the Chefs' Recipes where Chef Marco Baudone shares his recipes in English and in Swedish. Read other articles on Stockholm in the Destinations, Hotels and Resorts, Restaurants, and Chefs' Recipes (in English and in Swedish) sections.